Hi everyone! Welcome to Catherine's ink party collection release blog hop! You should have arrived here from Taheerah's blog. If not head on over to Catherine's blog to start at the beginning. 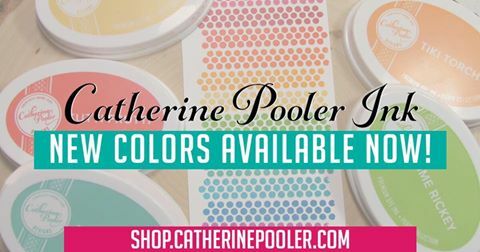 Catherine is releasing 8 new ink colors to the 5 previously released in the Foundations Box. The colors are so amazing, bright and fun!!! I love them all, so I just had to use them all on my card today. What a gorgeous rainbow of colors. You can purchase these inks HERE starting today. 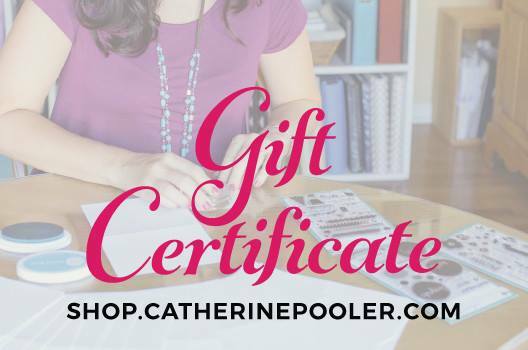 PSSST, I have a code for you to use to get 15% off your first order at Catherine's store. CLICK HERE!!! WOOT!!! I used the dotted chevron stamp from the Yay! Stripes stamp set and also the Thank you from Still Smiling, both by Catherine Pooler Designs. I used my MISTI to stamp the dotted chevrons. After stamping the first color, I moved my paper down a bit and stamped the next color. Continuing through all the colors and on the last color, Flirty Fuschia, I decided to use second generation stamping to get the light purple color. The sentiment was stamped over using Midnight ink. I popped the inked panel up on a card base using dimensional adhesive and added some sparkly clear sequins to finish it off. Catherine is going to draw 2 winners for a $25 Gift Certificate to her store. Leave a comment on ALL THE HOPPERS blog posts for your chance to win. Winners will be announced on Catherine's blog on Thursday at 6pm EST. Time to hop along to the next blog which is the awesome Deepti Stephens. Here is the complete blog hop list. 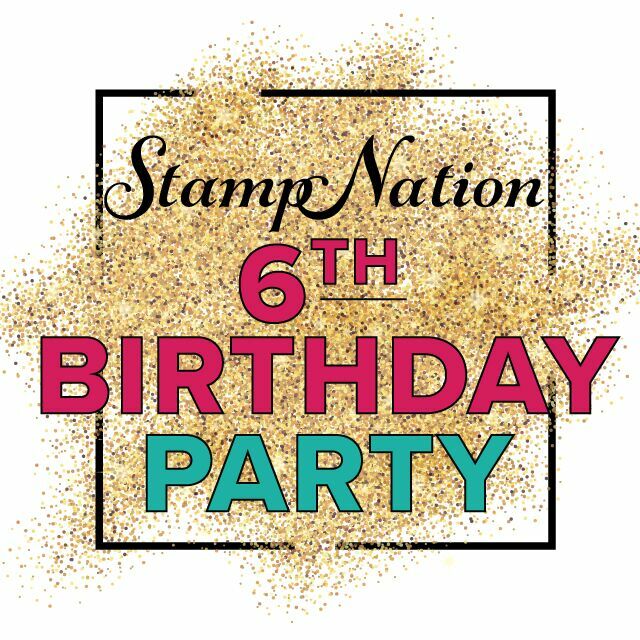 StampNation's 6th Birthday Party starts tomorrow. It is going to be a fun time with lots of fun challenges & amazing prizes from some amazing sponsors. You won't want to miss this! I am going dotty looking at this lovely card!! The crisp and vibrant colors make me happy! TFS! Fabulous card! Love how you overlapped the background just slightly! Gives it an almost 3D effect! Beautiful card Kristie the colors are gorgeous. Hi Kristie! I love that chevron dot stamp. You do an amazing job with CAS cards, you make it look effortless! Oh, wow! What bright colors. Seeing spots before my eyes. Such bright, fun colors. Love the dotty chevron. Oh Kristie I love that card! Great card, Kristie! You are so inventive and the colors are beautiful. I ordered it all. Your card is so interesting - love it! Oh Kristie, You used my favorite CP stamp for this card! This is a fabulous card! Pretty! That midnight ink really stands out, even on all of that color! Great inks! What a beautiful way to use these bright vibrant colors. Can't wait to get my hands on the new colors. Oh! I love your rainbow with the dotty chevron! And how clever to use second generation for the light purple. It really finishes it off! Look at all those beautiful colors. Great job Kristie. Love your card and your use of all these incredibly beautiful colors! Great card! Can't wait to get those inks in my hands!!!! Can't wait to get my order so I can try this technique. Awesome card. What a nice "thank you", bright & cheery! I love the look of chevron. What a colorful vibrant card... thanks for sharing your ideas. Great card, Kristie! You used my favorite stamp! Absolutely love the generational rainbow. Such a happy card! Kristie, that is absolutely SUPER COOL card with the chevron dots and that technique. LOVE it! Wow! Love your card. I don't currently own that stamp set, but I can see I'm going to have to. 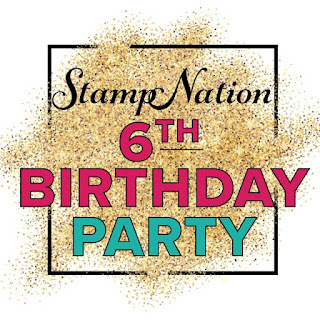 Love the way you used the new colors to create your card using those stamps! That is very cool, colorful, yet simple. Gorgeous. Love your card. All those vibrant colors make the card wonderful. Fabulous card! Love the rainbow colors with the dotted chevron stamp. Love your card! Just ordered the Yay Stripes along with all the inks this morning! Can't wait to get them to try them out like you did! What a fun card! And those ink colors! To die for. I love this card and the beautiful colors ! Love your card and all its vibrant colors! I can't wait to get my hands on those inks. I really like this effect! These inks are beautiful! You really outdid yourself with these vibrant colors! Love the dots! I love the card. Another stamp that I need to get along with the new inks. Card making is becoming a lot more fun. So cool! I love these bright, vibrant colors! The chevron idea is cool but the coolest is how well the midnight color stamped over it. Great job. Fabulous use of colors! Have ink will travel. Beautiful rainbow Kristie! Can't wait to get my hands on the new colours. These inks are really lively and bright! Your rainbow card really shows them beautifully! Love all those colors together! Great card. Loving all the different rainbow cards seems everyone loves the colors so much they need to use them all Fantastic! Really great example of the rainbow affect - using a great geometric pattern. Fuchsia - or purple - is really nice! Your card is awesome. Those dots show off the great colors wonderfully! Love this card. I tried one using this stamp....lets just say I have to practice a bit more! Thank you for sharing! I love this clean and simple card. Thanks for sharing. Really colorful card that anyone would love to receive. I love your card and wish I had seen your post before I placed my order. The price for all the new inks was still very good, and I'm excited to receive them in a couple of days. Catherine's shipping is always so quick. Kristie, your card is absolutely stunning! Love the way you have used the chevron dots with those gorgeous colors! Awesome card, these colors are amazing! Such a fun card, the colors are fantastic! Such a bright cheery card! Love the card. The colors go great together! Wow, fabulous background and that black really pops off of it! Thanks so much for sharing on the blog hop!! I'm happy to see you this stamp--love it and the colors of ink you used. The colors you used are fabulous and I love the design! Such a fun colorful background! The vibrancy of these new inks is amazing! Love how you've overlapped the colours Kristie - fun card. Such a fabulous card I love the colours and the way you used the dotted chevron. Love it. The inks really make this card POP! Great card. Your card just makes me happy & shows off the vibrant colors too! Love your card and the great colorful background you created. What a great fun card!!! Great colors and fun stamp make a great combination and the MISTI makes it easier. I love how you used the stamp -- it looks like a rainbow waterfall! Beautiful card! These colors are wonderful together! They are so bright, detailed, and just stunning!!! This card just makes me happy! So bright and fun. Anyone would be thankful to receive it. Love the card!!! So FUN!!! What a unique stamp to use as a background feature behind your message. The use of the colors too are so vibrant. Love the zig zag rainbow! The colors are brilliant! I have the first 5 and can't wait to get the other colors and try your beautiful technique! Love the mix of polka dots and chevron shape. The colors are stunning! Can't wait to buy them! Very cool card. I can't wait to do something similar. Love the rainbow background. Will have to order that stamp set! I like the way you used rhat stamp! I like your card, it is really bright. Oh I love how you overlapped them Kristie! Love your use of the dotted chevron. This is a fantastic card with beautiful bright colors! Awesome card. These inks are on my wish list and so glad they work well with the MISTI. Thank you for sharing. Love your colorful dotty card! That stamp set is at the top of my wish list, but had to order the rest of the inks first! Fell in love with the first 5 inks from the Foundation box! Love that stamp and all the colours. Great card Kristie! FF is just as gorgeous in 2nd and 3rd generations! Fabulous! I love, love, love this idea. And all the colors. Yea!!! Kristie, I love the bright cheerfulness of your card! Simple but very eyecatching! Love the ink colors! love this, I have this stamp, so now I need the inks! Dotty is a cheerful card! Can't wait for my inks to get here! 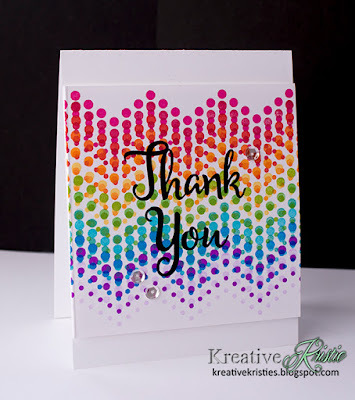 The chevron rainbow on your fabulous card is such an awesome way to showcase these inks! Love it! LOVE the dotted chevron design in rainbow colors, so vibrant and festive! GORGEOUS, Kristie! Your card shows off all the new inks so beautifully. Stunning card with those stunning colors! Pretty card. The colors are so bright. I love our card. I can't wait to try these out. So glad I just ordered the Yay! Stripes stamp set with my ink pads order! The 2nd generation purple at the end is perfect. Love the card. The brilliance of the black makes it look like its popping off them colors. Fantastic card. Lovely array of colors in this staggered chevron design...I feel like I'm looking at a optical illusion of rainbow magnificence! So colorful. I really like this card. I need to try something like this with my Misti. Great card and lovely colors!! Gorgeous, Kristi!! Love that cascading rainbow effect and how you did some second generation stamping as well. Beautiful layout! Stunning card! Love the dotty chevrons. And the new inks are just brilliant. I love the vivid colors. I can't wait for my inks to arrive! They look so vivid! When your blog post showed up in my email, Kristie, I was blown away by this card! You are an absolute genius in your pairing of colors and stamps to make WOW cards! I love the vibrant colors of the chevron background. Nice way to use all of Catherine's colors! Love the chevron! Great job! Lovely colors and beautiful card! Beautiful card!! Love all the colors! Love the card! Favorite color as of now is the Auqatini! But tomorrow is another day and that could change, like daily!! Colorful card, Kristie, perfect for showing off the inks. I love the bright rainbow of colors on your card!! I order this stamp set with my inks yesterday!! I have yet to use the zigzags from yay stripes, but I love how you've used it in your card! Oh my goodness, love love love!!! Love the rainbow colors with this stamp. Perfect rainbow effect! Love those dots! I want to try those ink pads! They make amazing stamping! Oooh! That is such a cool effect! I am loving these colors! What an awesome, eye-catching card! THat's it, I'm convinced I have to have these inks. So vibrant and pretty especially on the card you made. THank you so much for sharing and the chance. What a fun card, Kristie! I LOVE that border stamp! Maybe some day I will splurge on it. Thanks for sharing!! It looks like you get some pretty cool new colors where things overlap. Your cards are always awesome! So are you! Gorgeous card with gorgeous colors! Simple card that shows off the colors. Great card. Simple and beautiful. Love the colors. Pretty card. Colorful and happy. Love your technique used for your card! Such a fun and vibrant card Kristie! Love all the dots!